Eula (Benner) Davison, age 92, of Wyoming, went to be with her Lord on Sunday, November 11, 2018. Eula enjoyed knitting, sewing, following her great-grandchildren's activities, and watching the Tigers play ball. She was preceded in death by her husband, Robert; and sisters, Ruth Mars and Myrtle Harrison. Eula will be deeply missed by her daughter, Darlene (Guy) Wills; granddaughters, Roxanne (Jim) Talsma, Sheila (Al) Yost; four great grandchildren; three great-great-grandchildren; brothers, Lawrence Benner, Roy (Shirley) Benner; sisters-in-law, Eileen (Jay) Shook, Wilma Cutler; and many nieces and nephews. The family will greet visitors on Thursday, November 15, from 3 - 5 pm and Friday, November 16, from 10 - 11 am at Stroo Funeral Home, where the funeral will begin at 11 am. Pastor Gary Zinger will officiate. Interment will be in Chapel Hill Memorial Gardens. 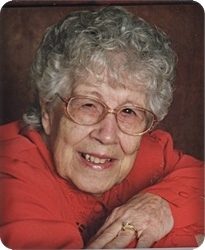 Contributions in memory of Eula may be made to Faith Hospice.